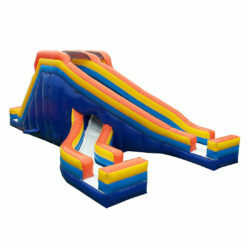 The Trap-Eze surely has to be the ultimate action inflatable game in our line-up! There is nothing else on earth in the field of inflatables that offer as much of a thrill as this. It’s a once-in-a-lifetime experience for some and a must-do-that-again experience for others. The Trap-EZE is an exact replica of a professional flying trapeze rigging with the second trapeze being the virtual ‘catcher’. If you have limited space we can remove the stairs on one side which reduces the length to 29′. This is the same size swing as the Trap-Eze but the whole rig is lower. This is less frightening, especially for the little ones when all they want to do is swing and land in the big ol’ bag. The targets are optional. The ‘hands’ of the mechanical catcher are in the exact same place that the hands of a live catcher would be on the flying trapeze. But there is a difference: it is a revolutionary concept because there is no safety harness and the trapeze bar sits right there in front of you, ready for you to swing on it every time. The catcher is always hanging in the ‘ready’ position to catch you! This is done with an ingenious invention – the ReTurn system. If a visitor happens to fall while swinging they will land on the fluffy soft and patented Zero Shock™ inflatable AirPad landing system.